We are now filling up for wedding cupcakes for 2013, if you are getting married next year and would like Little Millie’s to supply your scrummy cupcakes and wedding cake please get in touch as soon as possible. We are Norfolk’s Premier Wedding Cupcakes supplier. We will bake fresh and scrummy cupcakes for your special day, these can be any combination of our incredible flavours and designed to fit in with your individual theme. They can be filled with a gooey centre, infused with a jammy core, loaded with luscious lemon or just a gorgeous sponge, its your day and we are here to enhance it. 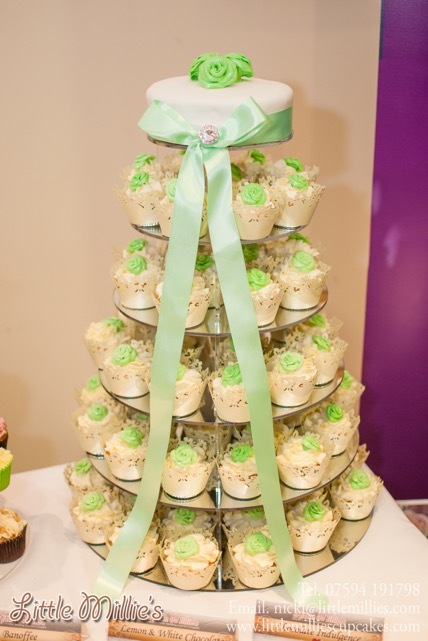 We can also bake top cakes or giant cupcakes to set off your incredible wedding cupcake tower. We offer an amazing package to suit your needs for the biggest day of your life, our cupcakes will be freshly baked and delivered to you or the venue at a time that suits you. Pick from any flavour combinations, match the colours to your wedding scheme. Feel confident knowing that Little Millies’s are making the lightest, fluffiest, tastiest, freshest cupcakes for your wedding. Using only the very freshest and finest quality ingredients and always free range eggs to guarantee the best cupcakes you could imagine. We also offer FREE cake stand hire (subject to a small returnable deposit) and personal delivery and set-up.